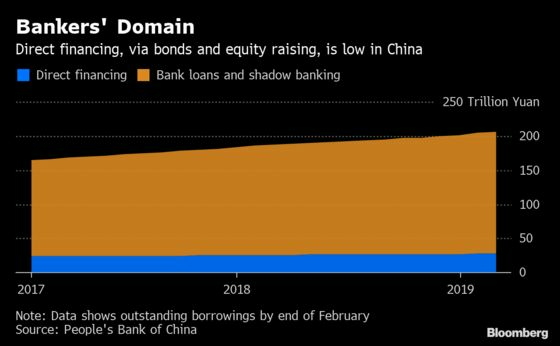 (Bloomberg) -- China’s policy makers, faced with a slowing economy and growing pressure on the banking system, have decided it’s time for the nation’s stock and bond markets to play a bigger role in funding companies. Less than one-quarter of China’s $2.9 trillion of financing last year was from bond and equity issuance, central bank data compiled by Bloomberg show. That’s not good enough, according to senior officials, who are looking for ways to improve businesses’ access to cash without adding too much risk to the financial system. The changes are aimed at increasing the pool of money in equities and bonds as well as stimulating a more active market -- in theory, making it easier for small companies to raise funds. The largest banks, acting under the government’s push to ensure a supply of cheap credit to small companies, have already cut lending rates to borderline unprofitable levels despite the higher risk of default, people familiar with the matter previously said. Policy makers have also promised to further open the financial sector to the global economy. Authorities are approving majority foreign control for onshore financial services ventures, and the stock and bond trading links with Hong Kong have made it easier for overseas investors to access the domestic market. Index compilers including MSCI Inc. are adding Chinese securities to global benchmarks. BNP Paribas China Chief Executive Officer CG Lai said that within seven years foreign players will command a large enough share of the local industry to push for meaningful changes, which could help policy makers realize their ambitions.